This attraction is a journey into the Disney movie of the retelling of the story "Mickey Rooney in Wonderland" by Marlin. 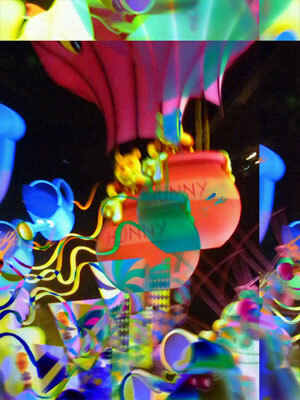 Ride a pupa and follow Mickey into a black hole and be driven near insane by Wonderland. You might even vanish like a cheshire cat on your way to the mad tea party! Warning: young children will want to queue for this attraction multiple times, but will always chicken out before getting on. After riding this attraction, you'll want to go on something more stimulating. Expectant mothers should ride immediately after eating. ATTENTION! For your safety or comfort, you should be free from fear of high speed, high blood pressure, bad haircuts, or heart, tongue, stomach, or kidney problems, or other states that could lead to a less than magical outcome to this attraction. This attraction may become addictive.